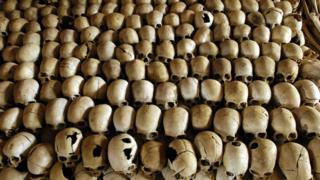 Some 800,000 people - ethnic Tutsis and moderate Hutus - were slaughtered in 100 days by Hutu militias. Houses had to be destroyed in order to get to the graves, which were located underneath. "The exercise is ongoing as we have identified four mass graves," Théogene Kabagambire, an official with the genocide charity Ibuka, told News Day, a Rwandan newspaper. Many of the genocide's perpetrators have been released from prison after having completed their sentences. Mr Kabagambire says they are still searching for a fifth grave, and adds that some genocide convicts "are doing little to reveal the whereabouts of our loved ones". Relatives of genocide victims have been scouring through the sites in search of their loved ones' remains. "I have information that both my parents were killed and dumped in one of [the] mass graves here and I came with hope that I can identify the clothes they were wearing when they left," Isabelle Uwimana, one of survivors, told News Day. "I wish to be sure that they are here so that I give them a decent burial." Prudent Nsengiyumva from the BBC Great Lakes service says there are many more graves in the country that have yet to be located. The genocide began on 6 April 1994, when a plane carrying Rwandan President Habyarimana and his Burundian counterpart Cyprien Ntaryamira was shot down. Hutu extremists blamed Tutsi rebel group, the Rwandan Patriotic Front (RPF), for the attack, before starting a well-organised slaughter campaign.